Dimensions: 16 cm long (includes 5 cm extension chain) and 1 cm wide. WITH WHAT CLOTHES IS THIS BRACELET GOING WELL? This bracelet has a detail that makes it very special: two strips that can be placed in various ways, which make it very versatile and adaptable to various situations. - You can drop the two strips to one side, creating a very original effect. - If, on the other hand, the strips are placed to one side, you will create a different and equally original combination. One idea: paint your nails blue or pearly white, and if you want, put a silver ring with some detail in blue. 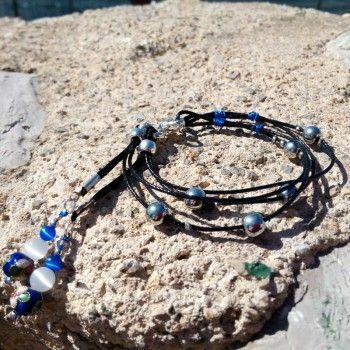 This bracelet can be used in a casual outfit. It is sober but has reflections and a touch of brightness, so it takes full potential in the afternoon or evening. It does not need to be at a party, it can be used for a dinner or a special evening. Remember that this bracelet can look more ornate or simpler, so you choose the occasion. It is your ideal companion! The handmade earrings "Simple Black" 3.5 cm long give your look elegance, sobriety and a blue touch with a unique charm. 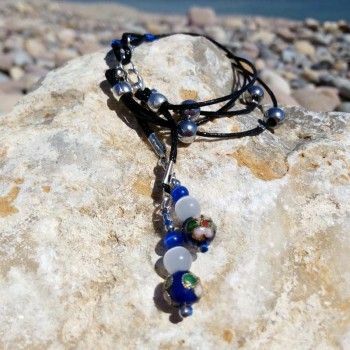 We combine the blue reflections of the blue goldstone with the black of the onyx and the iridescent details of the obsidian. The perfect complement that combines sobriety with a touch of sparkle.